Australian First Career Counselling and Development Program tailored to the individual needs of adult Domestic Violence (DV) Survivors. Working together with in a small group setting Blu Ripples will help and empower you to create, build or re-establish your career by teaching you a range of core career development and planning strategies to help you achieve your career goal(s) and in turn minimising your risk of returning to a violent relationship by securing your future, independence and freedom through the attainment of employment. Blu Ripples Career Counselling for DV Survivors Program is a unique, innovative, informative and practical five (5) session program (delivered 1 day per week or over 5 consecutive days), designed to empower and support adult survivors whom have permanently left their DV environment a minimum 12 months prior to undertaking the program. Blu Ripples Career Counselling for DV Survivors Program aim is to provide you with a professional support structure, reliable information and resources, practical and effective career planning, development, employment skills and strategies to empower you and to optimise your chances of obtaining meaningful employment within the short to medium term and/or to secure an educational placement at a public or private institution with the view to secure meaningful employment upon completion of your chosen course. Our program incorporates 3 learning styles and 8 key sections combining both individual and group activities designed to systematically engage and empower you to develop and implement a tailored and meaningful career action plan. 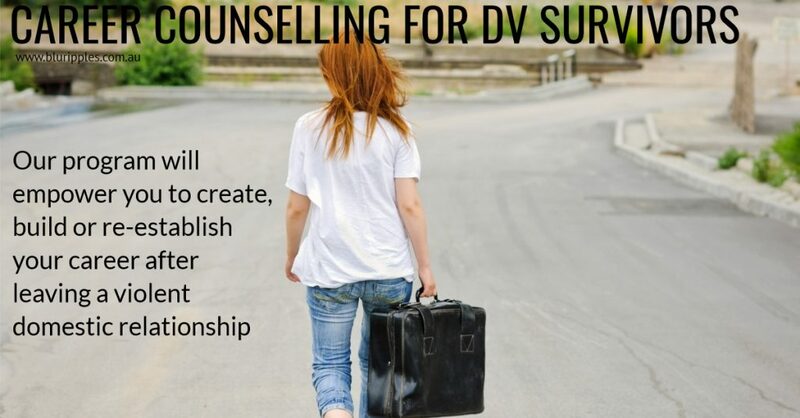 to deliver an empowering Career Counselling for Domestic Violence Survivors program to adult survivors whom genuinely seek to enhance their future. Katherine is a Professional Member of the Career Development Association of Australia (CDAA), Member of the Australian Counselling Association (ACA) and Australian Psychological Type Association.